OK so this goes against the grain of everything you were told at antenatal classes, every poster dotted around the hospital and quite possibly every health professional you saw during pregnancy. But really, it's true. Breast is best is actually just a really clever marketing campaign, but not originally from the people you might expect. In fact, it's a brilliant example of a very common marketing technique - and once you are aware of it, you can spot it around you on a daily basis. Let's take chickens (a leap I know but bear with me) a normal life for a kept chicken is really quite simple. A hen house to keep them safe at night, an area for them to move about, scrat and eat grain, water to drink and you're pretty much done. Veer away from these basic requirements and as you might expect you have problems. As Hugh Fearnley-Whittingstall has highlighted with his "chicken out" campaign, remove their outdoor wandering/scratting area, coup excessive numbers together - and you get unhealthy, underweight chickens that need large amounts of antibiotics and other drugs to keep them alive (with some companies injecting eggs with antibiotics before the chickens have even hatched!). These chickens when mature look so bad with their deformed legs and lack of muscle tone, they would never sell; plus they are so scrawny and underweight they wouldn't make enough money for the producers. So a process called "plumping" is undertaken; this is injecting the chicken pieces with salt water, sodium phosphate and "natural flavorings" (don't get me started on that one!) until they look like something you might be prepared to eat. The legal limit is I believe 15% "other stuff" - meaning a piece of "standard" chicken can contain more salt than a large serving of French Fries.. So in short, give a chicken a standard chicken life and you end up with a normal chicken. Treat it in an abnormal way and you end up with a chicken packed with antibiotics, excessive salt levels, flavourings and water. Let's picture accurate labelling of these products. The first - standard chicken, easy. The second hmmm "substandard battery chicken; includes antibiotics, salt, flavours, reduced protein and increased fat levels". I'm thinking the second isn't going to be a big hit in store. Retailing is about pounds kerchinging into the till, not accuracy - and so the marketing bods step in. The normal chicken is elevated to "best" and they give it a cool name like "free range", "organic", "finest" or "taste the difference". Lots of different ways to describe a chicken that has in reality, only had an existence which at least met the basic requirements. 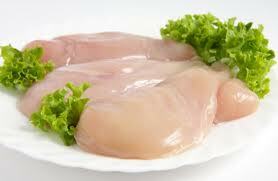 This allows the substandard, modified chicken to neatly slip in behind, taking the label "chicken". Good old standard chicken. Realistically, what is being sold as "standard" is in fact anything but. No mention of the health implications of eating something which is now considered more fat than protein, no mention of the injected substance, or how you are actually paying for this because chicken is often sold by weight. Nope - it's just "chicken". Supermarkets sell more "standard chickens" than any other type - and not just because of the price tag. In fact, even if the price difference was nominal, sales would still be higher. This is because the vast majority of people believe standard is "OK". Fair enough it might not have quite as much flavour as the "fancy one", but then they didn't home grow the carrots or make the gravy from scratch either. OK does most of us pretty well and this is what the marketing people understand! But let's not forget, in reality it's not standard, it's substandard that is cleverly marketed. This happens in all areas of retail - tomatoes ripened on the vine, where they are supposed to be and thus actually taste as they should, are "finest". Those picked early and ripened in boxes during transportation leaving them more like tasteless balls of water are "standard". Sausages that have more meat than fillers are "finest" and so on and so forth. Breastmilk is the bog standard, normal substance a human infant is built to consume - there's nothing best or superior about it. A survey a few years ago asked mothers whether they would buy a "value" formula, unbranded and in plain packaging - rather like the blue and white stripey budget tins at the supermarket. Absolutely not was the overwhelming response - the perception was that value branding compromised on quality, whereas standard ranges are "OK". It might not be "best" but it was fine. "Breast is best" is a slogan straight off the back of a milk tin and when you understand the marketing it's very clear why. With breastmilk substitutes it actually has a double benefit that isn't seen in other areas of retail. By law manufacturers are required to state on the tin that their product isn't as good as breastfeeding - as we saw above, should parents get a sniff of substandard they're off and so yep, it's time to call in those marketing bods again. Hmmm if we say breastfeeding is best, not only does that allow our product to slip in as "OK", but parents also (unaware of the laws) think we are mightily honest telling them upfront another product is "better" and so trust us; building loyalty and belief in whatever other information we give them. Ultimately sales are safe as we know most people aspire to "OK", not "optimum". Given most mums will end up using a breastmilk substitute, spending around £700 per year, we can afford to spend a fair bit on advertising to really drive this message home. Next time someone tells you breast is best - let them know, it 's really not at all, it's just normal. NB - the image on the right is a carton of Aptamil which violated UK laws. The carton claimed it was "closest to breastmilk" and also contained probiotics to "support the immune system". The Advertising Standards Agency ruled these claims unfounded and that they must be removed from packaging. The new label said: "Inspired by breastmilk" - which again was non-compliant with the regulations (Which are very clear!) Milupa was then bought out by Danone who relaunched with a new ingredient, branded as IMMUNOFORTIS. The Advertising Standards Agency found once again they had broken the advertising code clauses on substantiation, truthfulness and comparison. Thought provoking piece Armadillo. Tell me, how do armadillos feed their young? Well Annalisa that's a very good question. Many thanks and of course not feel free :) I've also just started a FB page which might be of interest to you or your blog readers? Great post! Thanks, will definitely be sharing. Hang on a minute, the aptamil carton says "compliments breastfeeding" are they allowed to say that? Wouldn't "causes milk supply to decline" be more apt? Brilliant......I have made this required reading for all of my students!! I really like this article. Very good analogy with the chicken I think. My only quibble is this bit: "Breastmilk is the bog standard, normal substance a human infant is built to consume - there's nothing best or superior about it." Yes it is true that it is not "best" but there is nothing bog standard about it. As your last article shows, it is an amazing substance with incredible properties. It is biologically normal, but then biology is amazing. It's like when a baby is born. Yes, it's normal and it happens every day but it each baby is a miracle really. I was just looking at my 12-week-old's fingers yesterday and marvelling at how perfect they were down to the last crease. It's like that with breast milk. Thanks Gina and absolutely! I purely meant "bog standard" in terms of what human infants biologically expect as their "normal" food. Bit like cow's milk is the bog standard food for calves, but yet to them will contain everything their species requires. Thank you so much for this artical. My baby daughter is 9 months old now and never took to breast feeding much to my dissapointment and not through lack of trying. I have since expressed all her feeds so she can have the norm via a bottle. Recently it has been a real struggle for me in doing this especially as I have a three year old too (I did the same for him for 7 months) This was just the boost I needed to encourage me to carry on a bit longer. I know, just to really rub it in, let's label formula as "Sub-standard milk replacement for all you abnormal mums who are just not tough enough to breastfeed. What do you mean you're breastfeeding for 2 hours out of every 3? That's what you're there for! How dare you be so selfish? What do you mean you've persevered for weeks and are still not providing enough milk for your little one? You can't be trying hard enough! What do you mean, you're going through mental and physical anguish trying to exclusively breastfeed and you just want to top-up? You selfish woman, think of your child!" I'm sorry but since having my little girl I have NEVER been made to feel bad for breastfeeding but I HAVE been made to feel bad for stopping and switching to formula. By all means promote and encourage bf but enough of the slating of people who choose a different way, for whatever reason! If you feel bad for putting your child on formula, that's your problem, your guilt. This article is spot on the money. Hi LittleMoo - I can't see anywhere in the article I've "slated people who choose a different way", and I can't see it because it isn't there. You use the words "choose a different way", yet from your comments it reads you had little choice? I think the two are quite different and we usually don't feel a heated emotive response at a true "choice". I do not call formula milk substandard to hurt mothers, but because it's the very real reality of the situation. Breastmilk is not some amazing "bonus" but purely the milk of our own spcies, anything that makes children less healthy is by very definition substandard. As long as we continue to idealise breastfeeding as some "optimum" way, with a substitute being "nearly as good", the support will remain at the terrible level it is, and mothers will continue to receive substandard support when they need it most. I think it's the parallel you draw with dodgy standard chicken that feels like a pretty harsh comment on those who formula feed. It's a stark but maybe unhelpful example for those who really have no choice. I'm currently reducing my supply as I need to get back on meds that are not safe for breastfeeding for my arthritis - to ensure i can look after my little one properly. An awful and painful decision even though I know it's the right one. I totally agree with the point of your article, just might be worth considering how vulnerable, emotional new mothers might be left feeling - whether or not they are willing or able to breastfeed. I don't compare dodgy chicken and formula, I compare the marketing techniques used for various foods. I'm sure you're not suggesting we shouldn't discuss marketing? Oh! I feel for you! What a horrendous, stressed, pressured situation to find yourself in! That is really hard. The Armadillo is one of a very few people who are working their socks off to ensure that other mums aren't placed in the sort of hell that you describe. Because you're right: BF can be awful. And when it goes wrong, it can be a ghastly downward spiral where everyone is stressed, towards the very outer limits of our existance. But there are ways to intervene, to change the circumestances, to make things better, to encourage positive outcomes that lead to upward spirals. And one of those is seeing a properly qualified breastfeeding counsellor. Even BFCs and IBCLCs can't solve every problem. Some are so entrenched that there isn't a good way forward. But for many, there is. Please, don't get angry with the armidillo for pointing out a truth that you may find feels like salt in a cut. Instead, let's find a way to turn the anger to those who have let you down. All very well but what can we do about it? I feel hopeless sometimes!! In the face of this massive overwhelming milk/money machine. Bit like David and Goliath. Is it hopeless? Can we change the world? "Ok" is never gonna cut it!! I disagree completely. Wouldn't we agree that a healthy cooked chicken breast is better than a nugget with fake meat? It may look good and be fine but it isn't the real thing, doesn't taste like the real thing, and isn't nearly as healthy. Exact same as breastmilk. Formula is fine but it is not nearly as beneficial. Formula cannot lower risks of cancer, obesity, or allergies the way breastmilk does. I realize not all mothers can breastfeed, my daughter couldn't at first. But formula is inferior to breastmilk. I like this post it’s very useful Woman’s face many problem Breast reduction is sensitive case so herbal way is good for this. I have come across mothers who despite expressing, domperidone and breastfeeding responsively could not build to a full supply (PCOS/hypothyroidism) and careful management of the supply they had enabled continuing breastfeeding and supplementary formula. I loathe the commercial pressures and separate these from the product - formula is essential. Breastfeeding and formula are different. Emotions can and understandably do run high around how we feed our babies - it's an emotive subject.